This Mark3 version of the Infra Red extender is a special version designed to control appliances that use high frequency modulated IR remote controls. The carrier frequency is determined by R1 and C3, values shown work at 39.7 kHz, but these may be altered to provide different carrier frequencies. The final CMOS 4049 invertor ensures that under "no signal" conditions both LED's are also off. 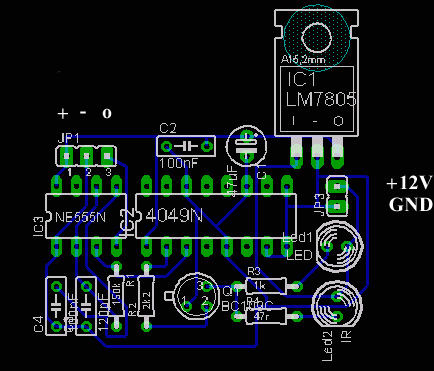 First the component side of the board is shown below. And now thw pcb itself. The Mark 3 circuit is an improvement over the Mark 1 and 2 circuits, however the drive from Q1 inverts the polarity of the output pulse. In some cases this can cause problems so the output stage is rewired as an emitter follower. 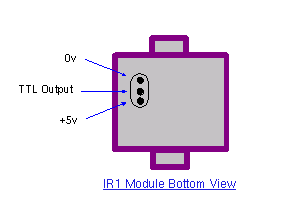 This is the basis for the Mark 4 circuit. If you still have problems then I would recommend trying the Mark 4 circuit.